The reasons for this are not yet clear, but the team—led by researchers from the University of Exeter and the Zoological Society of London—warn that this decrease in breeding age means disease-exposed populations are at greater risk of local extinction sparked by environmental changes. 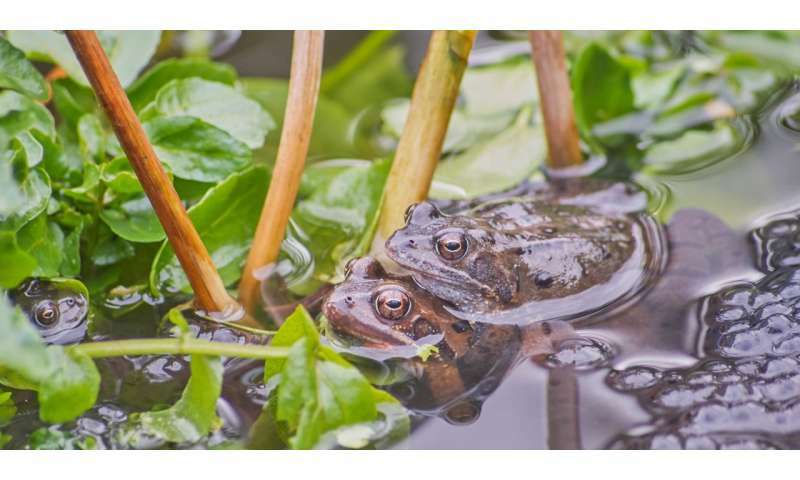 "Our research shows that the ages of the frogs that return to breed varies between populations which are known to have ranavirus and those which don't," said Dr. Lewis Campbell, who conducted the research during his Ph.D. at the University of Exeter's Penryn Campus in Cornwall. "The absence of older frogs may then create an opportunity for younger—and therefore smaller and less competitive—frogs to successfully breed. Commenting on the differences between the two kinds of frog population, Dr. Campbell, now of the University of Wisconsin-Madison, said: "Our models suggest both infected and uninfected populations can continue to thrive in normal conditions. "For these populations, an environmental change such as a late frost—that would kill frogspawn and further lower the number of offspring produced—could cause that population to collapse (known as a local extinction)." Dr. Xavier Harrison, of the Zoological Society of London, said: "We often think of the negative consequences of wildlife disease as being the death of infected individuals in the short term.